18-Jul-2009 -- I decided my first confluence should be a simple one, thus the 50N/107W. As I drove west, I crossed the 107W. I turned around, drove back a little ways, then south until I crossed the 50N. 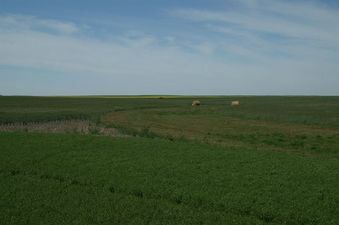 Typical of Southern Saskatchewan at this time of the year, it appeared the confluence would be in a sea of green crop, a short distance east of where I parked. Off the road and into a field of bearded wheat I strode, camera and GPS in hand. Sure enough, after a little hike (425m), there it was! N 50 00.000, W 107 00.000!! I could not suppress a grin, even though I was all alone. I took the required pics, albeit a poor one of me, stood and enjoyed the feeling of a beautiful Prairie scene and headed back to the car. I was somewhat startled when I dialed up Waypoint #151 and found that it was recorded at exactly 12:00 hrs!! No trickery, no editing, just pure, unadulterated luck!